Arctium is a genus of biennial plants commonly known as burdock, family Asteraceae. Native to Europe and Asia, several species have been widely introduced worldwide. Plants of the genus Arctium have dark green leaves that can grow up to 70 cm (28 in) long. They are generally large, coarse and ovate, with the lower ones being heart-shaped. They are woolly underneath. The leafstalks are generally hollow. Arctium species generally flower from July through to October. Burdock flowers provide essential pollen and nectar for honeybees around August when clover is on the wane and before the goldenrod starts to bloom. The prickly heads of these plants (burrs) are noted for easily catching on to fur and clothing. In England, some birdwatchers have reported that birds have become entangled in the burrs leading to a slow death, as they are unable to free themselves. Burdock's clinging properties, in addition to thus providing an excellent mechanism for seed dispersal, led to the invention of the hook and loop fastener. The taproot of young burdock plants can be harvested and eaten as a root vegetable. While generally out of favour in modern European cuisine, it remains popular in Asia. Arctium lappa is known as niúbàng (牛蒡) in Chinese, which was borrowed into Japanese as gobō, and is still eaten in both countries. In Korean burdock root is called u-eong (우엉) and sold as tong u-eong (통우엉), or "whole burdock". Plants are cultivated for their slender roots, which can grow about one metre long and two centimetres across. Burdock root is very crisp and has a sweet, mild, and pungent flavour with a little muddy harshness that can be reduced by soaking julienned or shredded roots in water for five to ten minutes. Immature flower stalks may also be harvested in late spring, before flowers appear; their taste resembles that of artichoke, to which the burdock is related. The stalks are thoroughly peeled, and either eaten raw, or boiled in salt water. Leaves are also eaten in spring in Japan when a plant is young and leaves are soft. Some A. lappa cultivars are specialized for this purpose. A popular Japanese dish is kinpira gobō (金平牛蒡), julienned or shredded burdock root and carrot, braised with soy sauce, sugar, mirin and/or sake, and sesame oil. Another is burdock makizushi (sushi filled with pickled burdock root; the burdock root is often artificially coloured orange to resemble a carrot). In the second half of the 20th century, burdock achieved international recognition for its culinary use due to the increasing popularity of the macrobiotic diet, which advocates its consumption. It contains a fair amount of dietary fiber (GDF, 6 g per 100 g), calcium, potassium, amino acids, and is low in calories. It contains a polyphenol oxidase, which causes its darkened surface and muddy harshness by forming tannin-iron complexes. Burdock root's harshness harmonizes well with pork in miso soup (tonjiru) and with Japanese-style pilaf (takikomi gohan). Dandelion and burdock is today a soft drink that has long been popular in the United Kingdom, which has its origins in hedgerow mead commonly drunk in the mediæval period. Burdock is believed to be a galactagogue, a substance that increases lactation, but it is sometimes recommended to be avoided during pregnancy based on animal studies that show components of burdock to cause uterus stimulation. In Europe, burdock root was used as a bittering agent in beer before the widespread adoption of hops for this purpose. Folk herbalists considered dried burdock to be a diuretic, diaphoretic, and a blood purifying agent. The seeds of A. lappa are used in traditional Chinese medicine under the name niubangzi (Chinese: 牛蒡子; pinyin: niúbángzi; some dictionaries list the Chinese as just Chinese: 牛蒡; pinyin: niúbàng). Burdock is a traditional medicinal herb used for many ailments. Burdock root oil extract, also called bur oil, is used in Europe as a scalp treatment. The green, above-ground portions may cause contact dermatitis in individual with allergies as the plant contains lactones. In Turkish Anatolia, the burdock plant was believed to ward off the evil eye, and as such is often woven into kilims for protection. With its many flowers, the plant also symbolizes abundance. After taking his dog for a walk one day in the late 1940s (1948), George de Mestral, a Swiss inventor, became curious about the seeds of the burdock plant that had attached themselves to his clothes and to the dog's fur. Under a microscope, he looked closely at the hook system that the seeds use to hitchhike on passing animals aiding seed dispersal, and he realized that the same approach could be used to join other things together. His work led to the development of the hook and loop fastener, which was initially sold under the Velcro brand name. Serbo-Croatian uses the same word, čičak, for burdock and velcro; Turkish does the same with the name pitrak, while in the Polish language rzep means both "burr" and "velcro". 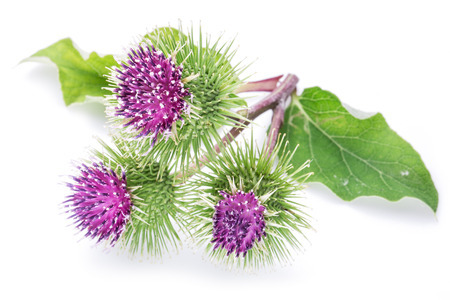 The German word for burdock is Klette and velcro is Klettverschluss (= burdock fastener). In Norwegian burdock is borre and velcro borrelås, which translates to "burdock lock".